If you were ever tempted to encourage your kids to run away with the circus, here's your big chance to get them off to a flying start—literally. Trapeze School New York proposes one of Manhattan's most unique activities, for both kids and adults alike, with assorted training programs dedicated to the aerial art of flying trapeze. 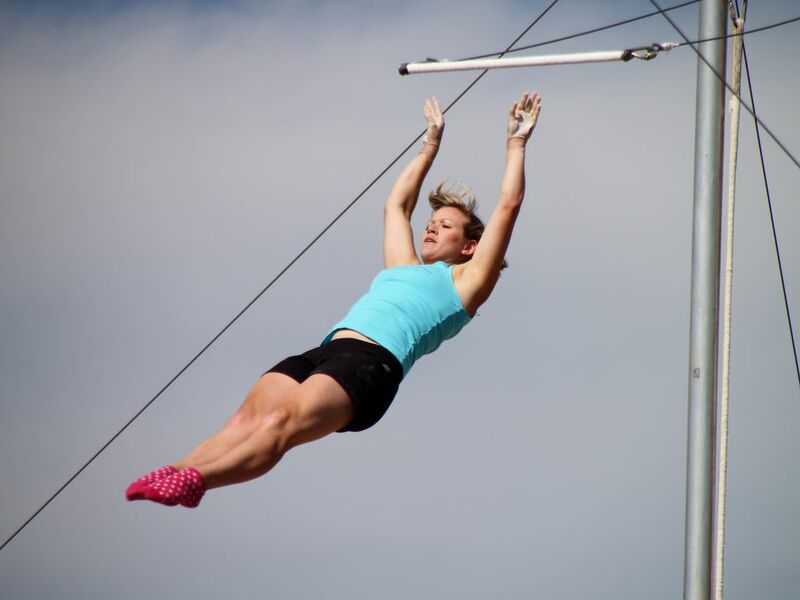 Sign up for flying trapeze classes geared toward all levels, from novice to advanced, and learn to "fly" (as it's so dubbed in the industry) in no time. On a recent visit with my two teenaged nephews, they were flipping and gliding through the air like old pros within an hour of their very first lesson—and are already eager to go back for more! Classes are run with a state-of-the-art trapeze apparatus, set to standard circus dimensions, with a jump-off platform elevated more than 20 feet high, and a soft, stretchy net, for controlled landings, set just underfoot. Safety's the first priority for the school, and participants are accordingly harnessed into safety belts, with a spotting system in place via trained staff. Group sizes are no larger than 10 and attract a good mix of adrenaline junkies, curiosity seekers, and those looking to face their fears. Students during our visit showed focus on the lessons, and developed a fast camaraderie, encouraging classmates on their efforts between turns. The goal of the two-hour classes are to get participants more trained in "air awareness," or, in their ability to gracefully move through space, be it via hanging, flipping, or falling. Expert instructors, typically working in pairs of two, hail from diverse professional backgrounds, stemming from past circus, stunt work, performance, and adventure gigs. No serious athleticism is required to participate, but do be prepared for a workout, as well as some sore muscles in the aftermath of your session, as you're sure to stretch some muscles you didn't even know you had. The school additionally offers trampoline classes, which also focus on body awareness and alignment—students learn to twist in the air and even do aerial somersaults. Classes, with levels from beginner to advanced, are 60 to 90 minutes in duration, with up to four participants ($40. Trapeze School New York's outdoor locations are operational between May and October and are located at Pier 40 in Hudson River Park (at Houston Street and the West Side Highway), and at Pier 16 at the South Street Seaport (South Street between Fulton Street and John Street). Between October and April, operations are offered indoors at the Circus Warehouse in Long Island City. Note that kids must be at least 6 years old to participate. Participants should wear snug-fitting clothes, including pants that cover the knees (to prevent chafing) and socks. Long hair should be tied back with a hairband (not plastic clips). Two-hour flying trapeze classes cost $50 to $70 per person. Note that outdoor classes may be canceled in cases of inclement weather. Visit newyork.trapezeschool.com to book and for scheduling details. Free NYC Concerts! You Won't Break the Bank for Some Summer Fun!